Set within 50 acres of beautiful North Devon countryside with sea views in the distance and directly overlooking our own wild flower meadows and lakes, the nearest neighbour to this beautiful country house is 1.5 miles away! So you are guaranteed privacy and exclusivity on your wedding day. They have five different locations within the property which are licensed. They include an old disused chapel and a beautiful outdoor walled garden. The capacity ranges from 30 to 200! 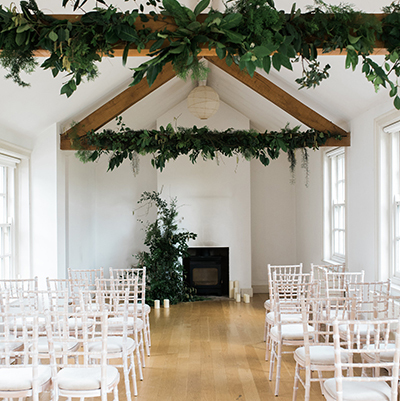 The Ash Barton Estate shy away from the “Package” type of wedding, preferring a relaxed and homely environment where the couple can choose the right vibe for their day. The venue offers self-catering accommodation that sleeps up to 47 and the best bit…? No curfew and no corkage! Yep, you heard me. At Ash Barton you get the opportunity to spend a few days with friends and family in an ultra-laid back yet luxurious surrounding. You can either totally DIY your day, or bring in your own choice of suppliers. The venue have suggested suppliers to help if you wish, but they don’t insist on anything. Weddings usually take place over a weekend – Saturday to Sunday. But, for Saturday weddings the venue can be available from Thursday to Monday for the same price including wedding rooms. Most couple’s choose to move in on a Thursday and have a family dinner party with their residential guests. Friday is spent decorating and preparing for the big day and Saturday is the day for celebrations! The festivities tend to be loud and late at Ash Barton thanks to their no curfew rule! So if you fancy dancing ’til dawn with your friends and family then this is absolutely the right venue for you. Sunday, the decor comes down and everyone’s hard work is rewarded with a barbecue and songs around the fire pit. The Ash Barton Estate also offer special rates for mid-week bookings, allowing a rather beautiful wedding at a very affordable price. You are free to organise your own bar, caterers etc. with no extra charges. They can also put you in touch with some fabulous local planners/coordinators to assist with the planning/on-the-day duties. This really is a wonderfully relaxed home… Beautiful yet robust.